Thank you for your interest in Cardiac Output Pods. Please complete and submit the form below and an ADInstruments representative will aim to get in touch within one working day. If you’d like to speak to someone immediately, office contact information is available from the contact page. For determining cardiac output in small animals (mice, rats, guinea pigs or rabbits) using the thermodilution technique. 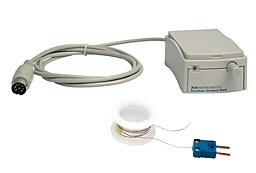 Includes the T-type Ultra-Fast Thermocouple Probe for determining cardiac output in small animals (mice, rats, guinea pigs or rabbits) using the thermodilution technique. For use with T-type thermocouples in the determination of cardiac output using the thermodilution technique. Cardiac Output Pods are used with high performance T-type thermocouples for the determination of cardiac output in small animals (mice, rats, guinea pigs or rabbits) using the thermodilution technique. Cardiac Output Pods have a 'delta' temperature mode to allow a signal offset to be applied and therefore allow small temperature variations to be monitored accurately. This unit is for use in the determination of cardiac output in animals ONLY. The Cardiac Output Pod can be purchased with or without the T-Type Ultra Fast Thermocouple Probe. We recommend this probe as it has a fast response time of 0.005 seconds, which is ideal for the thermodilution method. However, any T-type thermocouple can be used with the Cardiac Output Pod. In-built 30 Hz low-pass filter. Additional filtering (1, 2, 5, 10, 20 Hz) may be available depending on the model of PowerLab being used. A ‘delta’ temperature operating (ΔT) mode allows a signal offset to be applied which allows small temperature variations to be monitored accurately.